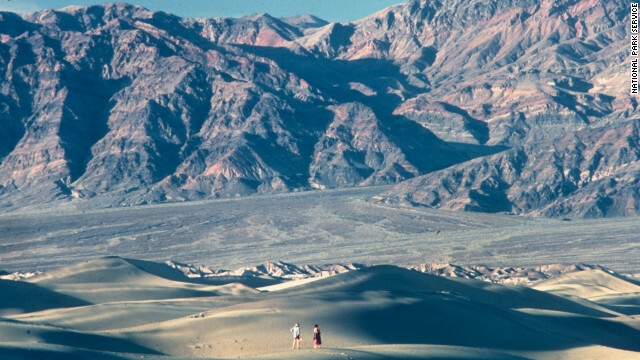 Death Valley, California, recorded a temperature of 134 degrees Fahrenheit on July 10, 1913. In a year that has seen the United States record its hottest month ever comes word that the country now owns the title of the hottest air temperature recorded on Earth. The World Meteorological Organization, the weather and climate agency of the United Nations, has recognized Death Valley, California, as the place where the planet has seen its hottest day ever, July 10, 1913, when it reached 134 degrees Fahrenheit (56.7 degrees Celsius). Death Valley was able to lay claim to the title when the U.N. agency invalidated the previous record, 136.4 degrees F (58 degrees C), that was recorded at El Azizia, Libya, on September 13, 1922. The Libyan mark was invalidated after an international panel of experts convened by the WMO concluded that there were five problems with the El Azizia observation: "(a) problematical instrumentation, (b) a likely inexperienced observer, (c) an observation site over an asphalt-like material which was not representative of the native desert soil, (d) poor matching of the extreme to other nearby locations and (e) poor matching to subsequent temperatures recorded at the site," the agency said in a press release. The 1922 measurement was likely about 7 degrees C too high, the agency said. Its investigation was conducted during 2010-2011 and included climate experts from Libya, Italy, Spain, Egypt, France, Morocco, Argentina, the United States and the United Kingdom. The record is a bit of a coup for Death Valley, as the title of the world's hottest place is "as symbolic for meteorologists as Mount Everest is for geographers," the WMO said. "Death Valley is famous as the hottest, driest and lowest place in North America," the National Park Service says on the park's website. The 1913 record occurred during a year of extremes for Death Valley. The weather station at Greenland Ranch (now Furnace Creek Ranch) recorded a string of five days at 129 degrees F or above in July of that year, and on January 8, 1913, posted the record low for Death Valley, 15 degrees F (-10 degrees C). Death Valley has reached the 129-degree mark four more times, in 1960, 1998, 2005 and 2007. The Park Service says Death Valley's hottest summer ever was in 1996, when it had 40 days higher than 120 degrees F (49 degrees C). Past 12 months warmest ever recorded in U.S.
Yay! Another # 1 for the United States! That proves the USA is the best country on Earth! We don't need to go to Iraq or anywhere near there anymore. Yes, we are number one in alot of categories but the rest of the world aint too envy of us though. For example, we have the most bigoted, divided and racist government in the world. The most bigoted and racist presidential candidate ever in Mitt Romney, the most bigoted and racist people in the world and most of them are in red states. The most haters in the world can also be found in red sstates. We are number one in sending our people off to die in sensele foreign wars, number one is turning our backs on our own citizens when it comes to healthcare and equal pay. Yes, we are number one and the whole world is laughing at us. And the most expensive health insurance in the world, the most over weight population in the world,the most generious country which send aids all around the world but we have to borrow money from China, ....so many mosts to name. El Azizz may be the hottest place ,and there are a few other candidates. Simply put there are places on the Earth that do not have on the ground thermometers. They don't have them because humans wouldn't servive to check, or service them.Fact we have not been to our deepest oceans,don't truley know the hottest places,and can drill so far into the planets crust. We send a lot of probes into space (which I support) but don't completlry understand our own planet's magnetic fields, weather ,and upper athmosphere. The artical can only mention what we can record and the Earth may be capable of more 150 deg + temps then we realize. It's taken them 100 years to work this out? Yes 100yrs to work the math. Or, maybe the liberation of Libya.. Highest it got this year was 122. I remember driving back from Vegas and passing through the Valley. If anyone can remember they have a huge thermometer that stands near the road for humorous obvious reasons. It read 107F, it was so friggen hot we stopped at a nearby Burger King to pick some Ice water. As we drove away 5 minutes later the ice was almost completely melted. That thermometer is in Baker, which is actually really close to Death Valley. The Death Valley`s highest temperature of 134 degrees Fahrenheit is suspect. It was not measured at the WMO recomended height of 1.25-2.00 m.(4 ft 1 in. to 6 ft 7 in. )and no adjustments have been made to bring it to the required height The height of enclosures was 3ft. 6 in. .That day we had strong winds which were blowing hot sand onto the enclosure which is not an ideal day because the highest temperatures are generally recorded on calm days or days with very low wind speeds .Also the temperature is not supported by nearby sites .Generally when Death Valley has high temperatures ,nearby stations record high temperatures but obviously slightly lower . Furthermore there is confusion about the original form .